Francis Pike’s monumental new book, a thoughtful and detailed synthesis… is a welcome addition to the work on the period. The title undersells the book’s contents. Most innovatively, the analysis of the war brings together the… Pacific War... and the China-Burma-India (CBI) theatre, where Chinese armies took the brunt of the resistance within China itself, while US and British empire troops were active in Burma. Pike’s narrative is arranged through battles and campaigns, and he analyses each with meticulous care... brings immense detail and sensible judgement to each one... One of the strengths of the book is that the weight of detail is complemented by sympathetic and plausible pen portraits of significant figures, including the generals who had to execute policy on the ground. At the 70th anniversary of the end of World War II, Francis Pike offers a comprehensive look at the Pacific War, which the publisher claims is the first single volume history of the war produced in 30 years. This book is well organized with subheads and serve in many ways as illuminating side-bars. The author is able to highlight some aspects that often go unremarked, such as the Chinese losses and the losses of Japanese soldiers to starvation. Pike also questions some assumptions of the causes of the war and the need for the fire-and atomic-bombing of Japan. 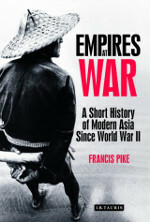 Pike (Empires at War)... offers a spectrum of fresh perspectives on a war generally presented in Western terms that minimize Japan's agency. He addresses the Pacific conflicts in WWII in the context of a comprehensive century-long struggle for dominance over the Pacific… Pike tells the story on a fitting scale.